The SAVAGE XL FLUX is Ready to Land! 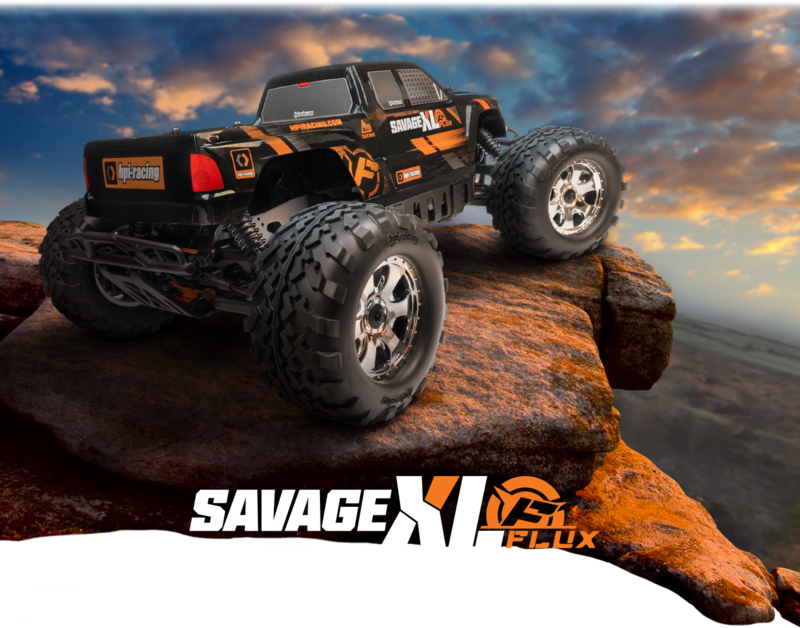 The Savage XL FLUX combines the awesome raw power of 6S LiPo brushless power with the stability of a long wheelbase in the legendary Savage HPI monster truck package! The colossally powerful FLUX 2200KV motor is ready for all the power you can run through it, and the FLUX 6S-capable electronic speed controller is fully capable of up to 22.2 volts of power to let you pull off giant stunts and jaw-dropping speed. The Savage XL FLUX is packed with options and ready to rock right out of the box! Easy plug-and-go convenience is the hallmark of electric RC trucks, and the Savage XL FLUX is no different. Just plug in two matching battery packs and you are off and running! 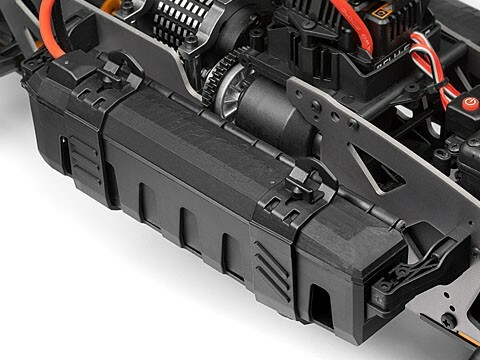 The Flux 6S-capable speed controller can handle massive amounts of power, and you can fit standard 2S or 3S LiPo batteries, or our extra-long #106397 2S and #107222 3S LiPo batteries designed just for the Savage FLUX line of trucks! Want to break the speed limit with your monster truck? With the Savage XL FLUX, it's super-easy! With 2 3S LiPo batteries and on-road tires like our #4729 or #4731 mounted Phaltlines you can hit 62 mph (100km/h) with the pull of a trigger! 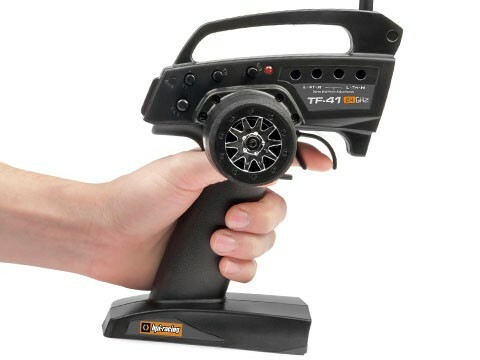 Like all HPI trucks, the Savage XL FLUX is easy to drive with the included steering wheel controller - but it shouldn't be handled by beginners! We recommend the Savage XL FLUX be driven only by RC hobbyists with plenty of experience and good reactions! With a pair of 7.4 or 11.1 volt batteries installed, the Savage XL FLUX gets up to insane speeds VERY quickly! Expect to get mud, rocks and dirt slung at you when you pull the trigger! Once you get used to the power of the FLUX 2200Kv motor, you'll be able to rip off huge stunts at your local skate park, achieve crazy fast top speeds in empty parking lots and throw up huge rooster tails of dirt! The power of the Savage XL FLUX cannot be denied! 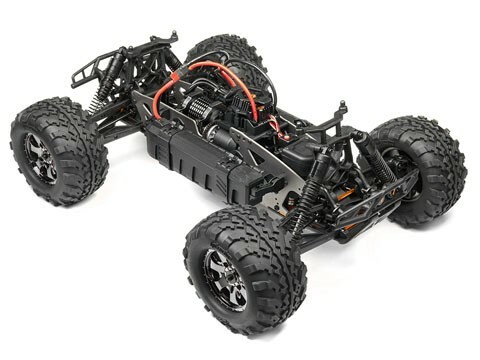 After over a decade of thrilling serious RC bashing performance, the HPI Savage has earned a reputation for being the toughest monster truck you can find. A pair of XL-Long 2.5mm thick aluminum Twin Vertical Plates (TVP) provide the backbone of the Savage, and a thick 7075 aluminum motor plate holds the super-powerful FLUX 2200Kv motor in place. The XL-Wide Savage suspension is ultra-tough, with super-thick webbed suspension arms and uprights built to handle gigantic jumps, rough landings, rolls and full-speed crashes. 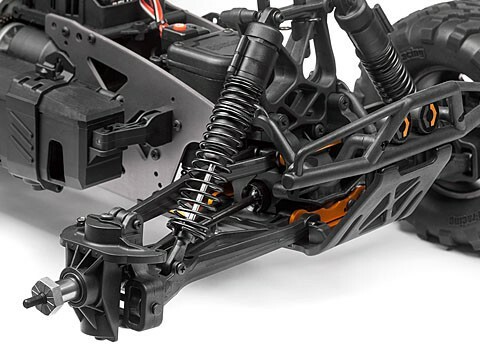 Super heavy-duty, bulletproof drivetrain parts like thick steel dogbones, all-metal transmission gears, sintered steel diff gears and metal diff cases make sure drivetrain can handle all the power of the XL-Powerful FLUX motor. Huge Big Bore dual-stage oil-filled shocks tame the roughest landings and terrain, giving you total control at all times! 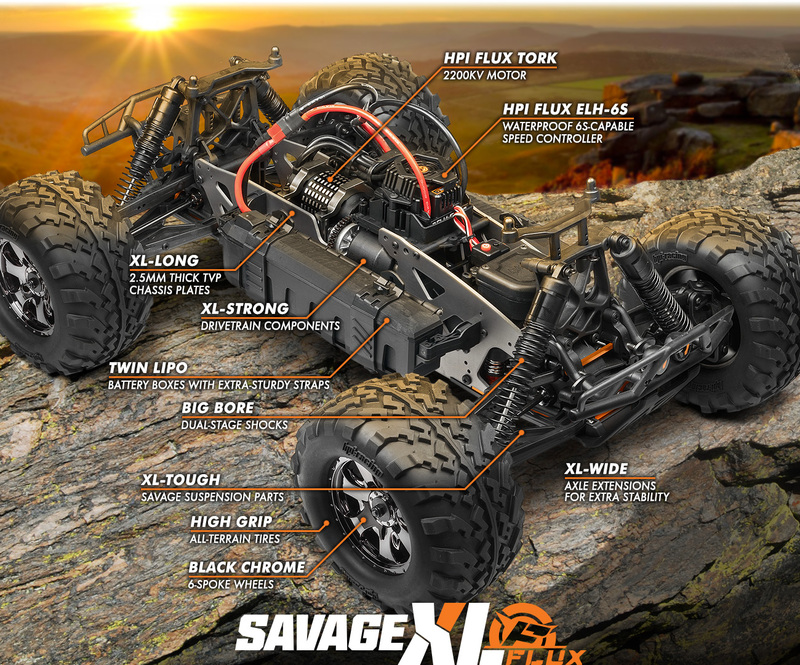 The Savage XL FLUX is simply the toughest electric monster truck you'll ever find! The Savage XL FLUX is based on the already awesome long wheelbase and extra-wide Savage XL platform, featuring a low-mounted FLUX 2200KV motor in place of the big-block nitro engine, a powerful FLUX 6S-capable speedo in place of the fuel tank, and twin battery boxes hanging on the outside to hold a variety of battery types. Power your Savage XL FLUX with a pair of matching LiPo batteries equipped with 2S 7.4v or a whopping 3S 11.1v power! 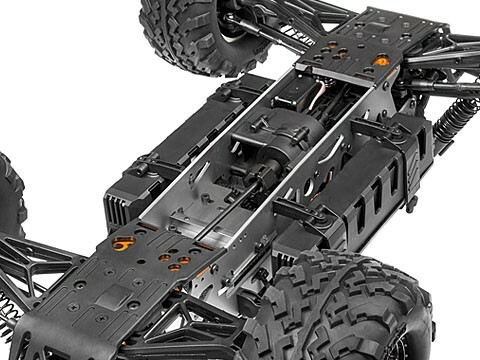 This truck is packed with HPI upgrades and options, including the 2.5mm TVP (Twin Vertical Plate) chassis, tough all-metal gear drivetrain, extra-powerful metal-gear servo, sintered diff gears and legendary Savage suspension parts and shock towers for extreme durability! Big Bore shocks at each corner of the Savage XL FLUX take up the shock of big-air landings and give you excellent control and traction on any surface. Please see our note below recommending LiPo batteries above 4000mAh and 25C to get the most out of the electronics in the Savage XL FLUX. Controlling the Flux 2200 motor is the Flux ELH-6S electronic speed controller, the most powerful brushless speed controller we could fit in the Savage XL FLUX. With the ability to handle twin 3S LiPo batteries (that's a total of 6S LiPo power!) it can deal with anything the Flux 2200 motor can dish out! 6.5mm bullet connectors secure the motor wires for loss-free connection to the 12-gauge wires, and to connect to each battery pack we've attached two real Dean's connectors for zero power loss and total efficiency. We figured why re-invent the wheel and release our own connector when the best is already available? Topping off the versatility of the speedo (literally) is an integrated cooling fan, which allows the speedo to operate at its ideal temperature. Finally, you have the ability to easily connect it to your computer for total programming control! With our #101856 Flux Reload ESC Program Box you can connect the ELH-6S to any Windows-based PC to control all the various facets of its power delivery, braking, throttle curves, battery cut-off and much more. You can also save various profiles to have profiles for racing, insane speed runs, stunts, fun running and more. 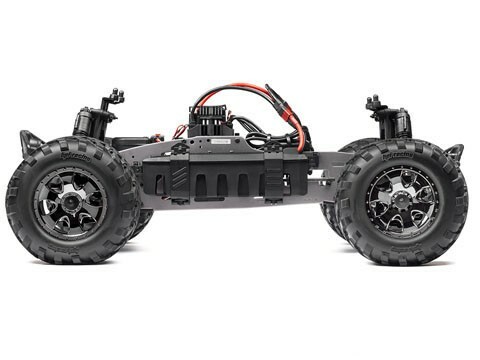 The FLUX 2200Kv motor sits extremely low in the chassis, providing as low a centre of gravity (CG) as possible, and the twin battery packs ride on the outside of the TVP chassis plates, where the tuned pipe and fuel tank on a nitro-powered Savage would usually rest. The low CG gives you extra control and cornering ability, allowing you to rule the corners on the track and pull off spectacular stunts to impress and wow your friends! To handle the FLUX power we've added nearly every drivetrain upgrade we have into the Savage XL FLUX! 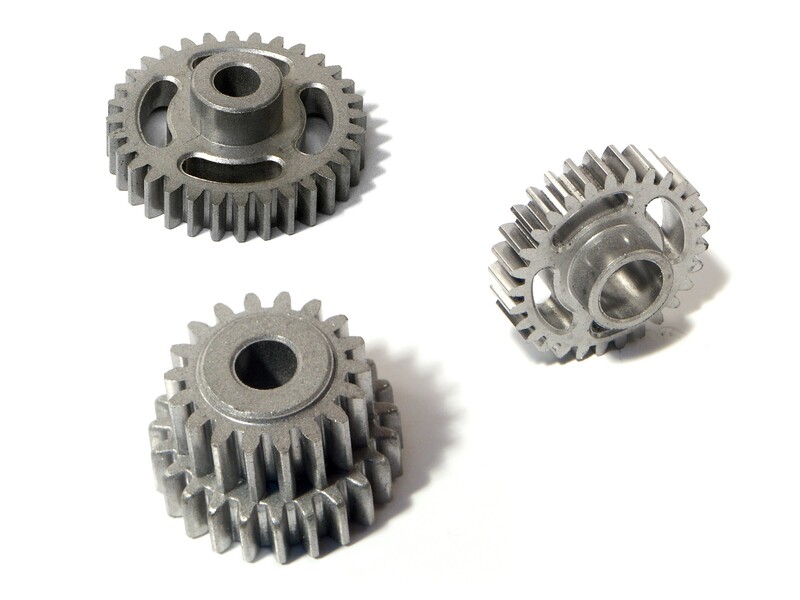 The spur gear and pinion are heavy duty steel and the transmission features all-metal gears. The differentials are fitted with extra-tough sintered metal heavy-duty differential pinion and ring gears, plus sintered metal 4-gear internals and metal casings at both ends. Steel diff outdrives, extra-thick super heavy-duty dogbones and steel extended axles finish off the drivetrain, and everything spins on rubber-shielded bearings to make sure as much power gets to the ground as possible! The drivetrain is equipped with a strong steel pinion and steel spur gear for extreme durability as you rip off huge stunts and jumps. For extra resilience, the spur gear is all-new with a dual slipper pad design. The spur gear is sandwiched between two lightweight aluminum slipper plates so the drivetrain is protected from hard landings. The entire drivetrain can be upgraded with nearly all the option parts available to nitro Savage owners, letting you upgrade your truck as desired so you can have the toughest Savage around! 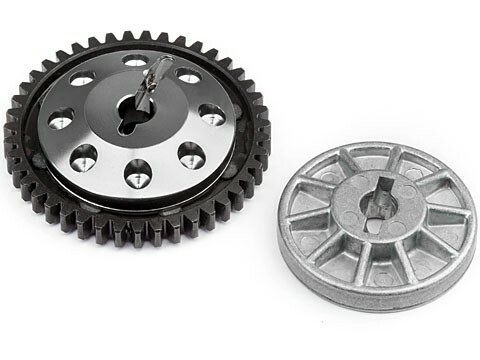 In addition to steel pinion and spur gears, the Savage XL FLUX features all-metal transmission gears to make sure that power delivery is uninterrupted and every bit of power gets from the motor to the tires efficiently and with no worry of damage to the gears. The whole drivetrain runs on rubber-sealed ball bearings for optimal efficiency, for extra-long runtimes and mega-fast top speeds! Extra-thick, super duty dogbones provide the insurance you'll want when you take the Savage XL FLUX way off-road and into rough country! 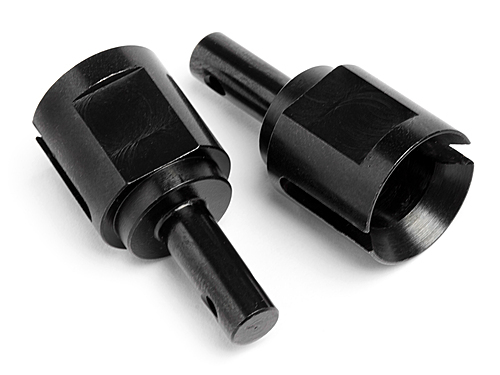 The thick diameter, larger ends and sleek black anodizing add up to all the assurance you'll want that the drivetrain won't let you down when the going gets tough! You'll be able to commit the full power of the FLUX 2200Kv motor to the ground without worrying about drivetrain breakages or anything else! The Savage XL Flux is fitted with the #86248 Super Heavy Duty Diff Shaft and #86249 Super Heavy Duty Wide Axle for extra drivetrain protection and durability. With an all-metal drivetrain running from the motor to transmission, and from the gearbox to the diffs, you'll have security and peace of mind that your truck will not only perform at its best, but last as long as possible in the roughest of terrain and conditions! The Savage XL FLUX features extra-strong uprights designed for extra durability and strength, giving you the assurance that you'll be able to deal out the same abuse that all the other nitro-powered Savage trucks can handle! Extra-beefy parts mean the Savage XL FLUX can take plenty of abuse and punishment, giving you plenty of big-air thrills before a parts breakages forces you to take a break. 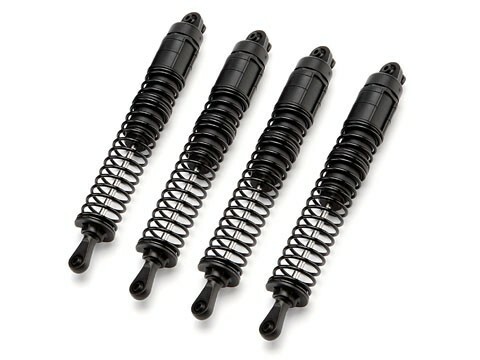 Four huge XL-size Big Bore shocks give all the suspension action you need to get out and blast through the roughest of tracks or off-road terrain. 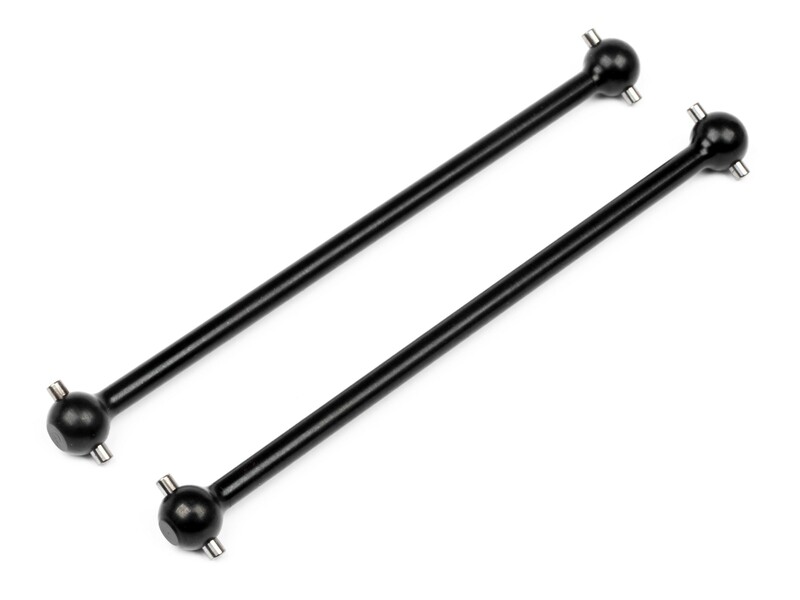 With slick nylon bodies they are lightweight and strong, with almost no friction 'stiction' between the shock piston and shock body. The extra-large capacity gives you extra control and damping action so you have the driving feel that makes off-road driving so much fun! Brushless motors like the FLUX 2200Kv are already super powerful with just one battery compared to their older brushed ancestors, so you can imagine what two battery packs will be able to provide! The Savage XL FLUX can take up to 16 NiMH cells (split up with 2 x 6-cell, 2 x 7-cell or 2 x 8-cell battery packs) or 2 LiPo packs of either 2S 7.4v or 3S 11.1v construction. The battery boxes feature cooling vents for the batteries and extra-sturdy straps with key locks to secure the packs in place. With the aggressive tread of the GT-2 tires, you can go off-road to on-road with cool, predictable handling and very little drama. 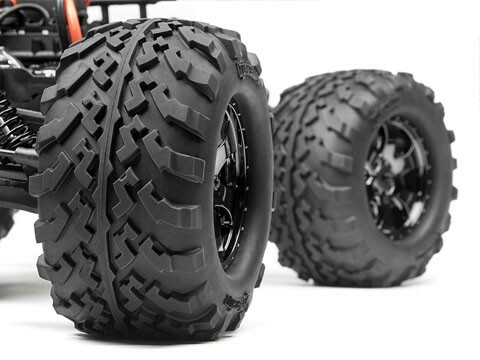 The centre tread lines give you stability on paved surfaces while the side treads and heavy-duty sidewall teeth grip any sort of dirt, mud, muck, leaves, etc., you can find on dirt roads or rutted fields. Drive with confidence knowing that the grip from your tires is the least of your worries. The ideal on-road tyres for your Savage - the #4886 Phaltline Tyres have conveniently been pre-mounted on the dazzling #3252 Tremor Wheel Chrome for easy replacement. The ideal on-road tyres for your Savage - the #4886 Phaltline Tyres have conveniently been pre-mounted on the stunning #3257 Blast Wheel Chrome for easy replacement.